President Trump has a big trip to El Paso planned for next week. Officially, he’s holding his first 2019 MAGA rally. Unofficially, he’s making his last big push for a border wall ahead of the February 16 deadline to fund the government. He’s chosen an interesting place to do it. While the rally will undoubtedly be full of rabid wall fans, border cities like El Paso, where county commissioners passed a resolution last year opposing the wall, are leading the charge against Trump’s prized campaign promise. Some are pushing back on the wall itself, while others are fighting the fervor surrounding immigration that the White House is trying to whip up. And the backlash is only growing stronger. 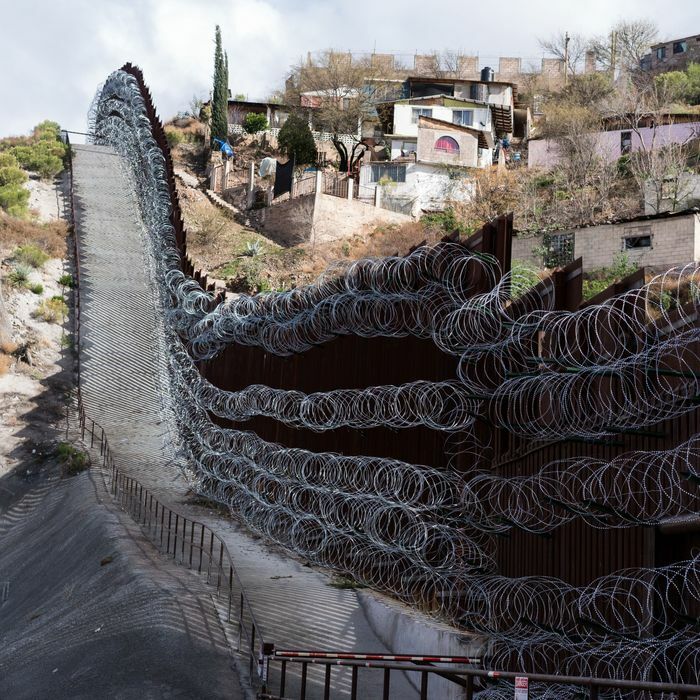 Just this week, the city of Nogales, Arizona, which already has a wall running through its downtown, threatened to sue the federal government if razor wire recently installed on the wall isn’t removed. A resolution condemning the wire was also passed by the City Council. It said the wire “is only found in a war, prison or battle setting” and has no place in the city. Nogales mayor Arturo Garino told the AP that the city is concerned about the danger posed by the wire, which the Army has installed in residential areas. He’s also worried that it will affect the perception of the town. “Aesthetically pleasing — it’s not. It’s very bad. It’s not good for business, it’s not good for what we’re trying to create, a business-friendly community here in Nogales,” Garino told the AP. Meanwhile in New Mexico, newly elected Governor Michelle Lujan Grisham has pulled National Guard troops from the state’s southern border. “New Mexico will not take part in the president’s charade of border fear-mongering by misusing our diligent National Guard troops,” she said in a statement this week. Border communities have been publicly opposing Trump’s call for months. In January, Jim Darling, the mayor of McAllen, Texas, said there would be no point in building a wall in his town. “We know where our border is,” said Darling, who’s also criticized the potential environmental impact of the proposed border wall. Pete Saenz, the mayor of Laredo, Texas, told NPR last month that his town doesn’t “need a physical wall.” Saenz is also the chairman of the Texas Border Coalition, a group of mayors and other local government officials that he said shares his distaste for a wall. “We consistently kept that position,” he said. Border area representatives in Washington are also unanimous in their opposition. Among them is Texas representative Will Hurd, the only Republican who represents part of the border. “I think building a concrete structure sea to shining sea is the most expensive and least effective way to do border security,” he has said.